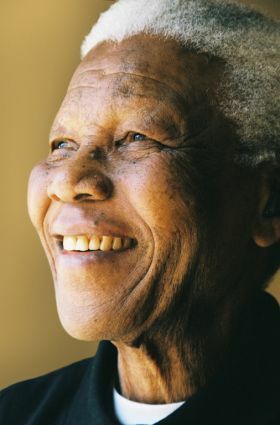 Back in 2003-2004, I spent more than a year trying to get an interview with Nelson Mandela for our series Mandela: An Audio History. Mandela has since retired from public life, but even back then his press secretary had created a fortress around him. One day, I got a call from Mandela’s friend and long-time doctor, Nthato Motlana, who was a big supporter of our project (Dr. Motlana was an inspiring man, and he died a few years ago.) Dr. Motlana suggested I come with him to Soweto where Mandela was receiving a big award and maybe there would be a chance to meet him and do a brief interview. I went. The event was a bust. I was in a sea of journalists, politicians, and celebrities all wanting to see Mandela; the closest I got to him was on the video monitor. Dr. Motlana offered to give me a ride back to Johannesburg after the event. On the way, we stopped in front of a big house. Dr. Motlana went in past the security guard while I stayed on the sidewalk and waited. Ten minutes later, the guard signaled for me to follow. I was brought into the yard, then into the house, then into the living room, then into the dining room. And there, at the dining room table, I could see the back of that unmistakable head. Nelson Mandela, his wife, Graça Machel, one of his daughters, two of his grandsons, and Dr. Motlana were all sitting down for lunch. There was an extra chair and place setting… for me. 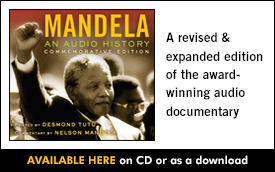 In the end, Mandela generously recorded an introduction to our radio series, speaking about the importance of understanding one’s own history. And I left his house feeling like I would take a bullet for that man.